Is your brake fluid bad? Is it damaging your master cylinder, corroding your calipers and breaking down the metal lines? Maybe, but you'll need a brake fluid test strip to be sure! FACT #1... There is a 90% chance your brake fluid is not protecting your brake system from corrosion and accelerated wear! Fact #2... Most systems would cost over $1000 to replace, with some being $4000 and more! So how do we know the exact time for change without guessing? Do you look at the mileage (we have to assume OEM's believe everyone drives exactly the same), or do you go by the brown color (but wouldn't brown be a sign rust has already developed)? This revolutionary product features the patented FASCAR® technology that identifies the exact level of copper ions in brake fluid. Copper is an early sign of corrosion in a brake system. Without correction with new fluid, corrosion can be extremely damaging to a brake system, compromising the integrity and safety of your brakes. The only "Certifiable" test system for Brake Fluid! Tells you the virtual age of the fluid based on "copper content", the MAP approved test method for determining when you should change this important fluid. FASCAR®, which stands for "Fluid Analysis by Stimulation of Contamination Alpha Reactions", is a simple visual test to determine the condition of your brake fluid. 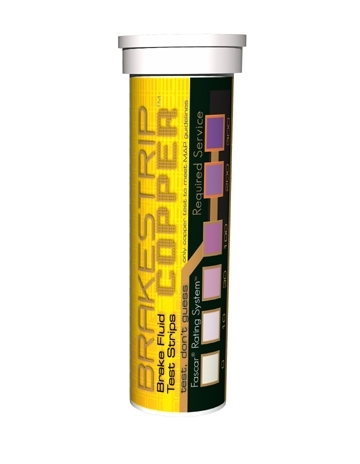 To test, immerse the new Strip Dip® into vehicle’s brake fluid for 1 second and within 30 -120 seconds the reaction zone will change colors depending on the condition of the brake fluid. Use the FASCAR® color scale to compare the reaction zone color to determine the FASCAR® rating. 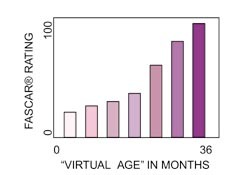 The "virtual age" of the brake fluid is determined by these factors and FASCAR® technology can measure their effects on brake fluid. As an example, a vehicle may have only 12,000 miles, but due to the thermal effects on the brake fluid it may have a "virtual age" to that of brake fluid with 30,000 or more miles. This condition has been demonstrated on high performance vehicles that are repeatedly subjected to high amounts of heat. FASCAR™ can measure these effects, as well as others, in a simple visual test. The only brake fluid recommendations that are made world wide are TIME and MILEAGE based. Over 70% of the world’s auto manufacturers recommend brake fluid flush service based on a TIME/MILEAGE criteria or "AS NEEDED". There was no technology available that could track TIME/MILEAGE or the "AS NEEDED" condition of brake fluid. Hence, the need for FASCAR® technology. 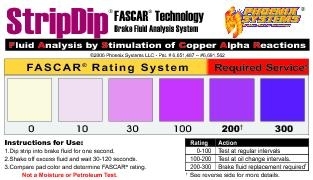 Strip Dip® using FASCAR® technology is the only brake fluid test in the world which makes a brake fluid flush recommendation based on TIME/MILEAGE criteria. *To conform to OEM recommended flush intervals Euro/Asian vehicles have a higher standard. What Happens When Brake Fluid’s Ability to Protect is Impaired? If you wait until your brake fluid fails a moisture test, it may already be too late! After brake fluid corrosion inhibitors are severely depleted, corrosion of the internal components begin. Corrosion can pit the metal bores of the master cylinder, slave cylinders and ABS components. This means that pistons cannot move freely, seals can be damaged and cylinders can develop internal or external leaks. A thorough brake fluid flush-and-fill is cheap insurance. This report, prepared for Phoenix FASCAR, is an analysis of the chemical changes that take place as brake fluid is used in service. The report addresses how the amount of dissolved copper in the fluid can serve as an indicator of the age and protective ability of the fluid. The conclusions here come from my interpretation of experimental data made available to me, and my professional scientific and engineering analysis. The references section at the end gives some of the information sources I used in preparing this report. Brake fluid is a hydraulic fluid mixture that must function under many months of service and under periodic high-temperature conditions. The main governmental standard imposed on brake fluid is that it have a high boiling point so that pockets of vapor will not form in the braking system under severe braking conditions. For instance, moisture-free DOT 3 fluids must have a boiling point above 400 °F. This can be compared to the boiling point of 387 °F for pure ethylene glycol (automotive antifreeze). In fact, many of the molecules that make up DOT 3 and DOT 4 brake fluids can be considered “larger chemical cousins” to ethylene glycol. DOT 3 and DOT 4 brake fluids are hygroscopic, meaning they will mix with and absorb water, which lowers the boiling point just like with antifreeze. This has led many people to incorrectly believe that a low boiling point caused by water absorption is the only thing that can go wrong with brake fluid. Current automotive brake systems contain steel components, such as cylinders and valves, connected by lengths of copper-alloy-lined steel tubing. Both the steel and the copper components are unavoidably subject to corrosion. One need hardly mention that corrosion and wear of the metal surfaces can interfere with the proper operation of these components, leading to a diminished margin of safety. Fortunately, the addition of standard corrosion inhibitors by brake-fluid manufacturers significantly slows the corrosion of critical steel components, leading to much improved service life. Recently there has been increased attention to the fact that the protection offered by the corrosion inhibitors in brake fluid does not last indefinitely. As brake fluid ages in service, its chemical constituents undergo a number of changes. Ordinarily none of these fluid chemical changes are immediately catastrophic, but cumulatively and over time they lead to decreased braking-system protection and performance. As already mentioned, decreased boiling point (associated with water absorption) is well recognized as a sign of brake-fluid aging. However, this is not the complete picture. As discussed below, an increased level of dissolved copper in the solution is an important and reproducible indicator that the brake fluid is no longer effectively protecting metal surfaces from corrosion. In order to better understand the changes taking place in the brake fluid, it is necessary to have a little background in corrosion science. The main principle is that rust is a more natural and stable state of iron than is a shiny machined steel part. Rust is composed of iron mixed with oxygen. Similarly, other metals such as copper corrode spontaneously by reacting with oxygen. In practical environments it is impossible to fully prevent corrosion; instead it is a matter of trying to slow it down as much as possible. For most metals (gold is a notable exception) exposed to dry air, a thin layer of the metal on the surface reacts with oxygen in the air to form a dense oxide film. This film "passivates" and protects the rest of the metal by acting as a barrier to greatly reduce further reaction with oxygen. Unfortunately, when water or a similar solvent contacts the metal, it partially dissolves the protective metal oxide skin, leading to increased corrosion in the presence of oxygen. The problem is typically made even worse in situations where there are aggressive chemicals or high temperatures present. Note that most of what we know about metals and corrosion is for the case of water mixtures; however, the same principles apply to brake fluid. metal + dissolved oxygen + acid = dissolved metal. There are a few ways to "starve" this reaction and therefore slow down the corrosion: First, one can attempt to reduce the amount of dissolved oxygen in the solution. In the case of brake systems, it is nearly impossible to prevent oxygen from absorbing into the solution due to the fluid-air interface in the master cylinder, and the slow leakage of oxygen into the system through rubber parts. A second scheme is to reduce the acid in the system by adding chemicals that are alkaline. This scheme is used in brake fluids. A third scheme is to add chemicals to the system that stick to and coat the metal surface, providing a barrier in addition to the metal oxide film to slow things down. This scheme is also used in brake fluids. Water is known to degrade the integrity of the oxide film on metals; however, water is not the only solvent that can do this. Corrosion can take place in other liquids, such as those that make up brake fluid. Furthermore, there is no practical way to keep brake fluid completely moisture free, so there will always be some water present near the metal surface. I am aware of only two scientific studies of corrosion in brake systems (both are listed in the references section). Neither showed that the amount of absorbed water in a brake fluid was a main controlling factor in how fast the metals corroded. There is one more complication I need to introduce into the corrosion picture, namely that individual metals differ in their susceptibility to corrosion and also can corrode one another. This can work to advantage or disadvantage depending on the system. Here I consider three metals: zinc, iron, and copper. Zinc is the least "noble" of the three - meaning most susceptible to corrosion - while copper is the most noble. I give some examples of this metal-to-metal corrosion behavior below. Galvanized nails used in home construction are steel nails that have been dipped in molten zinc to form a zinc coating on the outside. Because zinc is less noble than iron, it will corrode before iron will. If the zinc coating is ever broken, and dissolved oxygen gets to the exposed steel surface, the surrounding zinc will "sacrifice" itself and react with the oxygen before the iron does, and thus protect the iron. Copper, being the most noble of the three metals I listed, is the best protected against oxidation or corrosion under normal exposure to dissolved oxygen. This is the reason that plumbing pipes in homes are generally made of copper, not steel. However, in a situation where copper metal has already been corroded and dissolved into a liquid, it will attack any iron metal (steel) it comes in contact with. This is because, like zinc does for iron, the iron will sacrifice itself for the copper. The result is that dissolved copper will come out of solution and plate onto the surrounding steel, while a proportional amount of iron will dissolve and go into solution. While the initial corrosion reaction of copper requires oxygen and acid, the second reaction where dissolved copper corrodes the iron does not have this requirement. This chemistry is important in explaining what can happen in brake systems with aged and degraded brake fluid. The Highway Traffic Safety Administration of the U.S. government conducted a six-year engineering analysis (EA94-0038), culminating in a report in year 2000, to investigate decreased performance and possible failure of anti-lock braking systems on light trucks and SUVs. During the course of the investigation the agency contracted the services of the National Institute for Science and Technology (NIST). The scientific tests by NIST indicated that it was possible for corrosion to take place in the brake system so as to form deposits of foreign copper particles around the sealing surfaces of the steel PWM valve. The effects of a leaking PWM valve on vehicle braking performance were studied in a separate report (EA95-026). The important lesson, as I discuss below, is that copper is not necessarily benign and inert in the presence of iron and could lead to degraded braking performance. Corrosion inhibitors come in many varieties, but the ones used in brake fluid are typically based on a chemical group called "amine." The amine-based inhibitors are well known as being able to protect iron or steel from corrosion in aggressive high-temperature liquid environments. For instance, amines are widely used as corrosion inhibitors in steam boilers. Individual amine inhibitors work in one of two different ways: (1) by reducing the acid level (neutralizing or buffering amines) and (2) by forming a water-repelling barrier film on the metal surface (filming amines). In brake fluid, the amount of amines present is usually reported in terms of "reserve alkalinity," a scientific term that indicates how much acid can be added to the brake fluid before the neutralizing ability of the amines is exhausted. However, neutralizing amines alone will not adequately prevent corrosion in the presence of dissolved oxygen. This is because even in a buffered alkaline solution (high pH) there is still a small amount of acid present to slowly feed the corrosion reaction. To give full protection, the inhibitor package requires the help of the filming amines as well. However, reserve alkalinity does not necessarily account for the presence or absence of the filming amines, and so gives only a partial picture of how much protection is left in a given sample of brake fluid. A fact that is rarely appreciated is that the amines do not protect copper as well as they protect iron. This is backed up by the observation that dissolved-copper levels in brake fluid begin rising almost immediately upon the fluid being put into service, and the levels rise consistently throughout service. On the other hand, dissolved-iron levels do not begin to rise noticeably until the corrosion inhibitors have already been significantly depleted. A significant experimental study was conducted jointly by researchers at Delphi, Union Carbide, and General Motors and published by the Society of Automotive Engineers in 1997 (see references section). The researchers examined the durability of corrosion protection in brake fluids. They found that the corrosion protection declined sharply with time in service. The following numbers are telling: Reserve alkalinity was between 10 and 20% of its initial level for the tested fluids after 30 months of service (about 23,000 miles). Furthermore, they found that by 40 months of service (about 34,000 miles) most of the amine inhibitors were deactivated by thermal reactions that turned them into non-inhibiting chemicals. Interestingly, they found that around 60% of the amines-both active and inactive-were lost entirely from the brake fluid by this time. They believed this to be due to the amines being volatilized (evaporated) into the air space of the master cylinder and by permeating out through rubber components. Experiments by both Phoenix Systems and the industry researchers mentioned above have found that dissolved copper levels in brake fluid increase nearly constantly with time of service. The SAE paper reports copper levels at 150 to 300 ppm (parts per million) after 30 months of service. In contrast, the respective levels of dissolved iron and zinc are significantly smaller and do not follow as clear of a trend with time. It is true that dissolved iron could be used as an indicator of a problem, because elevated levels of dissolved iron clearly show that corrosion has occurred. However, this may not be the best practice in a routine maintenance program that is intended to keep corrosion low at all times, rather than respond to a problem after it develops. In summary, copper concentration level in the fluid is one of the clearest available indicators of time-in-service for brake fluid. It can serve like wear indicators on brake pads do, warning when a problem is imminent rather than just warning when a problem has already developed. Moreover, copper is much more than a benign indicator of brake-fluid service time. Copper plays a key role in the chemistry of corrosion for the brake system. The problem as discussed above is that relatively unprotected and large copper surfaces can corrode almost from the outset of fluid service. The corrosion of the copper-lined tubing is less worrisome than it is for the moving steel parts in the brake system, because close tolerances are not as essential for the tubing. The problem, however, is that the dissolved copper then goes on to attack and deposit itself on the steel surfaces once the corrosion inhibitors are sufficiently depleted. The presence of high levels of dissolved copper in the brake fluid indicates that the steel surfaces in the brake system are already or will soon be under attack. The SAE study included an attempt to create artificially aged braking fluid for testing purposes. The researchers found that two things were required to create fluid that behaved similarly to fluid that had seen many months of vehicle service: (1) significant amounts of added copper and (2) elevated temperatures in order to thermally degrade the corrosion inhibitors. Simple thermal degradation without adding copper did not lead to fluid that correctly mimicked the corrosive action of truly old brake fluid. In fact, the researchers speculated that the copper metal added to the system acts as a catalyst to promote the degradation of the amine-based inhibitors. My analysis suggests that the presence in the brake system of copper as well as amine-based corrosion inhibitors is an unfortunate combination that in the end works to promote iron corrosion. It is known that amines associate strongly with dissolved copper. Any filming amines that associate with copper in solution cannot at the same time do their job of protecting iron. Therefore, elevated levels of dissolved copper may interfere with the effectiveness of the filming amines in preventing corrosion of the steel surfaces. 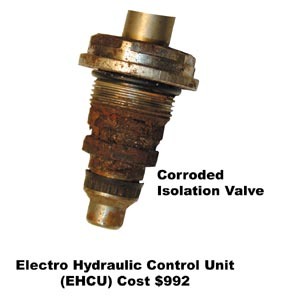 There are additional factors that can aggravate the corrosion problems mentioned above. For instance, anti-lock braking systems create greater circulation of brake fluid in the system. This circulation causes dissolved oxygen and dissolved copper to transport more freely throughout the system, likely leading to greater corrosion exposure that inhibitors must then counteract. This could lead to more rapid depletion of inhibitors than in a non-ABS system. Similarly, city driving with its more extensive use of braking will lead to elevated temperatures in the system. Spontaneous chemical reactions always speed up at higher temperatures. Therefore, higher temperatures accelerate all of the undesirable corrosion-both of copper and iron-as well as the processes that degrade the inhibitor package. Therefore, an automobile that has seen "hard driving" with frequent use of brakes is likely to show greater depletion of the inhibitors and loss of corrosion protection, as well as greater copper concentration, for a given time or mileage in service. So the use of copper concentration as an indicator will naturally account for some degree of variation in user abuse of the braking system. On the other hand, elevated temperatures will tend to reduce the amount of water that would otherwise be in the brake fluid. This is because water, with its lower boiling point, will volatilize more strongly than other components as temperature is increased. In contrast to dissolved-copper measurements, boiling-point and reserve-alkalinity measurements are less effective as indicators of fluid-service time. This is because these two quantities can vary so widely from one manufacturer's brake-fluid formulation to the next. Unlike in a laboratory experiment, a technician in the field has no foolproof way of knowing the baseline level of either quantity. For relatively new cars it is reasonable to assume that they contain the OEM-formulated brake fluid, but for a car that has been in service for a few years the brake fluid is a big question mark and could by that point even be a mixture of different manufacturers' brake fluids. For instance, the SAE paper notes the wide variations, with reserve alkalinity levels for fresh commercial brake fluids ranging from a low of 3 to a high of 120. These researchers also warn that reserve alkalinity only measures general acid-buffering ability and not the concentration of particular inhibitors. Therefore, it would be unlikely that one could reliably predict either (1) months of service of the brake fluid or (2) remaining strength of the full corrosion-inhibitor package using boiling point or reserve alkalinity. G.L. Jackson, P. Levesque, and F.T. Wagner, "Improved Methods for Testing the Durability of Corrosion Protection in Brake Fluids," Paper 971007, SAE Technical Paper Series (1997). R.E. Ricker, J.L. Fink, A.J. Shapiro, L.C. Smith, and R.J. Schaefer, "Preliminary Investigations Into Corrosion in Anti-Lock Braking Systems," Internal Report 6233, National Institute of Standards and Technology, U.S. Dept. of Commerce (1998). focuses on the issue of "brake fluid maintenance". The FASCAR rating system provides you with an accurate method to "suggest" or "recommend" a brake system flush. A brake fluid test will yield a FASCAR™ rating of 200ppm or above when fluids ability to fight hydraulic system corrosion has been compromised. This provides the technician with an accurate tool to sell a brake system flush NOW, one that actually makes the car safer, helps new parts survive their warrantee periods and prevent more costly repair in the future. Simple, economic solution to help "prove" when a brake system flush is required. Caution: Brake system flushing can cause old hydraulic components to leak when "sealing" contamination is removed. We recommend that customers be advised of this possibility prior to performing any brake service, especially a flush. brake fluid replacement at 200 ppm of copper. A FASCAR rating of 200 equals 200 ppm of copper. 1. Immerse the reaction zone in brake fluid for about 1 second. 2. Shake off excess liquid from the strip. 4. Compare the reaction zone with the FASCAR rating scale and read result. 5. If rating is 200 PPM or higher the system "requires" a flush and brake fluid replaced *.